Made with good for you ingredients, these delicious Mini Chocolate Quinoa Crunch Cups are a healthier way to satisfy your chocolate cravings. I was browsing Tieghan’s recipes on Half Baked Harvest when I saw this recipe for Superfood Chocolate Quinoa Bark. I loved her idea of combining some super healthy ingredients with some dark chocolate to make a delicious and yet healthy treat. Tieghan has some very creative recipes on her site and if you haven’t seen her blog yet you should definitely check it out. I adapted her recipe somewhat, deciding to use mainly seeds and made these Mini Chocolate Quinoa Crunch Cups. The crunchy mixture in these cups is made by combining quinoa, chia and sesame seeds and some unsweetened coconut and cocoa nibs for extra flavour and texture. The mixture is sweetened with pure maple syrup and baked in the oven until fragrant and caramelized. 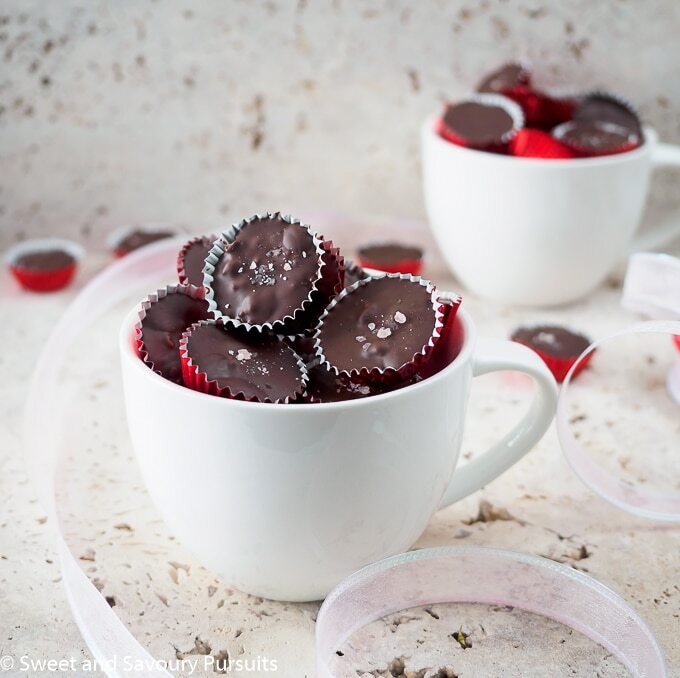 To make the mini chocolate cups, you simply combine some of the melted dark chocolate with the crumbled up seed mixture and spoon it into mini paper cups. 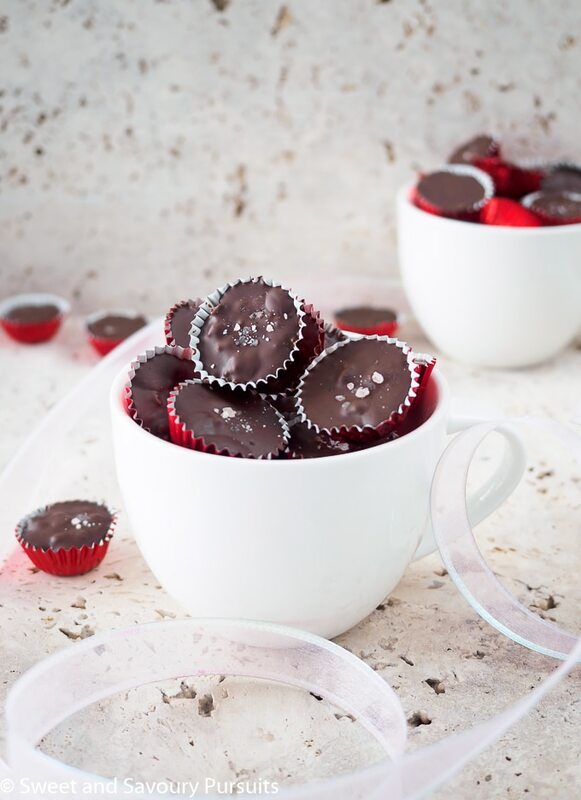 Finish the cups off by topping them with additional melted chocolate. I sprinkled some of the cups with little flakes of pink Himalayan salt, but this step is optional. This recipe makes more of the toasted quinoa mixture then you actually need for the chocolate quinoa crunch cups, but I left it as is, because I loved the crunchy mixture so much that I used the left-overs to top my yogurt, but you could also add it to your bowl of cereal or granola. I haven’t tried this, but I’m pretty sure that a few tablespoons of the mixture in a muffin batter would add some great texture to your muffins. 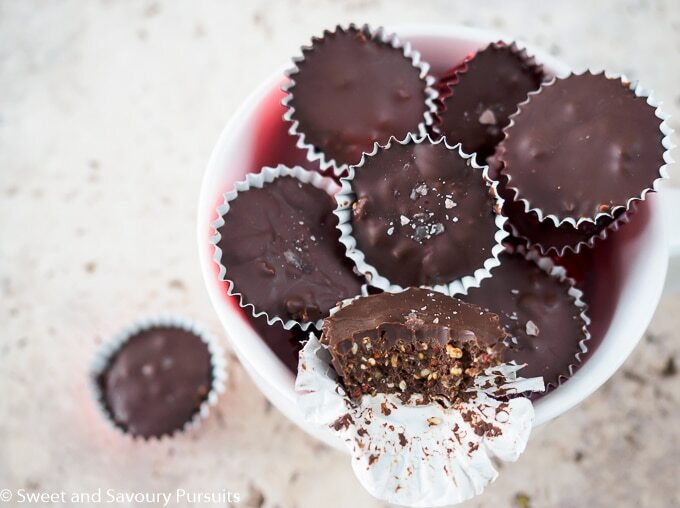 Hope you give this recipe a try because with such amazing for you ingredients, these mini chocolate quinoa crunch cups are more like little morsels of goodness! Happy Valentine’s Day everyone! Pre-heat oven to 350°F. Line a baking sheet with a silpat or parchment paper. Rinse the quinoa under cold water, drain and put in a skillet over medium low heat to dry the quinoa and lightly toast it. Quinoa will start to making popping sounds when dry. Meanwhile in a small saucepan, over medium-low heat, combine the maple syrup and coconut oil and let it come to a gentle simmer. Remove from heat, add the vanilla and salt and stir. Once the quinoa starts to make the popping sound, add the coconut, cocoa nibs, sesame and chia seeds to the skillet. Pour the maple syrup mixture over the seeds and stir to evenly coat the dry ingredients. Pour the seed mixture onto the lined baking sheet and spread it evenly with a spatula. Bake for 15 to 20 minutes or until the mixture is fragrant and toasted. Remove from the oven and let the mixture cool. Meanwhile, melt the chocolate in a double bath or in the microwave oven in short bursts of time. Once the chocolate is melted, pour 1/2 cup into small bowl and add 1 cup of the seed mixture, making sure to crumble the larger pieces. Mix the chocolate and the seed mixture until you have a uniform texture. Spoon the mixture two thirds up the mini paper cups and then top each cup with a bit more of the plain melted chocolate. Optional: If desired, sprinkle little flakes of pink Himalayan salt on the chocolates before they set. Once you have filled the cups you can place the mini cups in a mini muffin cup pan for easier storage in the freezer or refrigerator. Once the chocolates are set they should be stored covered in the refrigerator or freezer. Thanks so much! I know what you mean, I like to find those as well! Oh my goodness you have me DROOLING with this recipe! It looks heavenly! Hi Crystal, that’s great, I checked the post out and there are some delicious looking recipes there. I shared it on my facebook! Thanks for finding my recipe delicious enough to include in your roundup. These sound so good, Fida! I love all the healthy ingredients, too! Thanks Nancy, I never thought that chocolate and quinoa would be so delicious together! Thanks Sabrina, I love Half Baked Harvest such a great blog. Oh my goodness, I love all the healthy delicious ingredients in these treats, Fida! This is proof that healthy eating can be so tasty, too! You have inspired me to do some baking. Great recipe! Ahh, thanks so much Robyn! I’m really happy with the way this little treat turned out. Simple to make, healthy and delicious, can’t ask for much more! These are the cutest things, and healthy too. Just perfect for Valentine’s. Thanks, Fida!